The word “Bible” c omes from a Greek word that means “the books.” It is actually more a collection of writings than a single book. Most of the writings are shorter than what we would consider a book. The collection “was produced over a time span of about one thousand five hundred years. Century after century men added to this book,”[i] often not even fully aware of each other’s writings. In spite of that, it has a remarkable consistency. 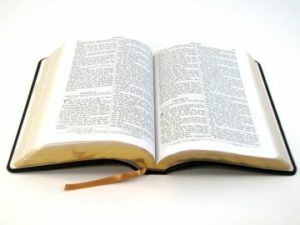 The Bible has two main divisions. The first, written almost completely in Hebrew,[ii] consists of the Jewish sacred writings, which Jews call the Tanakh. This name is an abbreviated combination of the names of the three sections into which they divided their writings, namely the Torah (which means “Instructions”), the Nevi’im (prophets), and the Ketuvim (writings). In the Christian Bible, these writings are somewhat rearranged and some of them are separated into more than one writing. These form the 39 writings that appear in what Christians call the Old Testament (OT). Though the material is arranged differently in the Tanakh and the Old Testament, the content of the Jewish and Christian collections is identical. These writings cover the period from the creation of the world to about 400 BC, although the actual writing began in about 1500 BC. Christians add another 27 writings, all originally written in Greek,[iii] which form the Bible’s second division. These were produced in the first century of our era and are called the New Testament (NT). The word, testament, is really the same word as “covenant,” which describes a particular kind of relationship between people. In the Bible, it refers to the way God relates to his people. In the Old Testament it is the way God related to the Hebrew people, who were the descendants of a man named Jacob, whose name was later changed to Israel. He was the grandson of Abraham and the main part of the Bible’s story really begins with him. The Hebrews are often called Israelites or “the children of Israel” because of their descent from Jacob who became Israel. The Jews are mainly descendants of one of Jacob’s sons, named Judah, although some of the other Hebrews also became part of them. The New Testament begins with four separate accounts of the life of Jesus, who is its main character. It describes both the events in Jesus’ life and his teachings. The name, New Testament or new covenant, was used by Jesus himself during the last meal he ate with his disciples before his death. It means that he was introducing a new and greater way in which God would begin to relate to his people. After these stories there is one book of history, called “The Acts of the Apostles” or “Acts” for short. It tells the story of how Jesus’ followers spread the news of him far into the Roman Empire of their day. Then comes a collection of letters written by Jesus’ early disciples to help guide his other followers. The NT ends with a book of visions given to one of Jesus’ closest disciples named John. Some churches add some additional writings to these collections. Some of these come from the period between the two testaments (400 BC to 1 AD). These shed some interesting light on the history of that time and help us understand the way the Jews thought at the time Jesus appeared. Others of these writings come from the first century and beyond. But the 39 writings in the Old Testament are what both Jews and Christians consider their sacred writings. The 27 writings added in the New Testament are what all Christians agree are additional sacred writings. Though there is value in these other writings, all the most important teachings of the Christian faith can be found in the common 66 writings. [i] Bruce Wilkinson, Kenneth Boa, “Talk Through the Bible” (Thomas Nelson: Nashville, Tenn.), (1983), p. xii. [ii] There are a few short passages originally written in Aramaic, which was a dialect of Hebrew. [iii] Jesus and his closest disciples probably spoke several languages. His sayings show signs that they were originally spoken in Aramaic, which was undoubtedly his common household language.